Well, things at the Bunn Sharing Garden are popping! The flowers on the tomatoes and tomatillos have made way for tomatoes hanging on the plants. We're hopeful tomatillos will soon follow. Oh, contain yourself! My garden plan for this year consists of three 4x4' raised bed containers, which means I needed to build two more boxes. 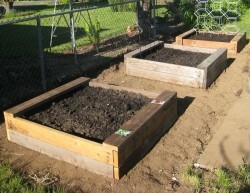 Here's my simple "how to" for building raised garden beds. I've been a member here on HOMEGROWN since it debuted as a social network and have enjoyed following the conversations and getting inspiration from all of the things people are working on, but I haven't written any blog posts here - until now. Exciting to be witnessing history, isn't it? My Globe Artichokes are FINALLY Budding Out!!! This last weekend I made homemade noodles. Quite tastey, I might add. I remember my Mother making noodles when I was little, having me help unroll them and laying them out to dry on the counter. So lately, I have been craving these noodles.. especially after telling Bryan how fantastic they were when I was little. My stories of my Mother's cooking always prompts cravings and brings nostalgia. There's something completely rewarding to step out front and pick our lunch. 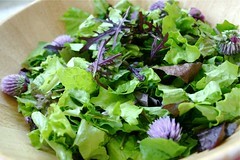 Lettuce, chives, herbs are all producing in the garden and landing in the salad bowl. I really should count the amount of steps from kitchen to vegetable bed. I don't think I'd need to carbon offset those steps, would I? Oh sweet sarcasm. Let's do it visually. We planted a row of turnips which, at the first rain, all washed to one side of the row. ...by using recycled coffee cups to maximize root size. 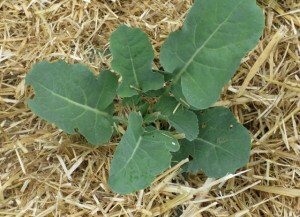 Ed Bruske at The Slow Cook has a great recommendation for taming rigid straw into usable mulch - a leaf shredder - great tip! Today I made friends with a woman who breeds rabbits for use as pets. Because I came to take her poo. 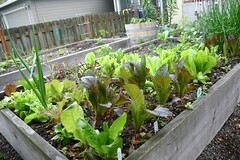 Last Fri/Sat/Sun, we planted the two acre Bunn community Sharing Garden. Everything grown in this garden will be given away to local families and local food distribution centers. We planted some of the plants we had: tomatillos, tomatoes, and Hatch's chile peppers. We also planted seeds for radishes, turnips, beets, carrots, cucumbers, cantaloupes, peppers, beans, lima beans, peas, and more. This past weekend, the hubby and I drove down to NYC for the Brooklyn Food Conference - a volunteer-organized gathering of food activists and curious eaters. Like Meredith said in her post, there were waaaaay too many workshops to attend (70! In one day! ), 3000 people came eager and left energized. Che, my 3 year old, and I picked our first 2 blackberries yesterday. It's been fun teaching Che to be patient with the berries. As soon as they started turning red, he's been wanting to pick them. When he saw they were darker, he was very excited that picking day had arrived.